In March 2013 we produced a draft volunteering strategy for 2013-2016 and we asked residents and local people to tell us what they thought of the draft document. Many people said it was not easy to find out what volunteering opportunities were available, and that it was especially difficult for some groups, such as mothers with young children or people with disabilities to get involved. Others said that there should be more support for volunteers who were looking for paid employment. It was also suggested that it should be made easier for smaller businesses to support community groups. We took these views on board to refresh the volunteering strategy for Camden and we have produced an action plan that sets out what needs to be done to implement the strategy. The action plan will be reviewed next March (2014) to ensure that the actions are still the right ones to take and identify whether new actions are required. We took these views on board to refresh the volunteering strategy for Camden and we have produced an action plan that sets out what needs to be done to implement the strategy. The action plan will be reviewed next March to ensure that the actions are still the right ones to take and identify whether new actions are required. 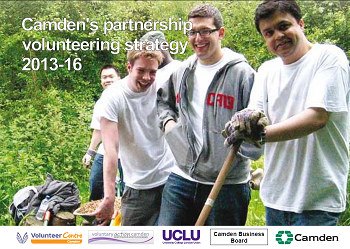 Camden has a strong tradition and history of volunteering. We are a rich borough in terms of skills, experience and enthusiasm. These assets can be harnessed to make a significant difference to individuals, organisations, communities and businesses. Benefits from volunteering are created both for those who give and for those who receive. We need a volunteering strategy to ensure that there is joined up working across all relevant sectors so that we can strengthen the combined impact of existing efforts and develop new opportunities for the future. We are consulting to ensure that as many people as possible have the opportunity to comment. We would like to capture the diversity of volunteering possibilities and aim to ensure that all potential volunteers are able to find opportunities which suit them. Send your comments on the draft strategy to Frances Connelly. After the strategy has been agreed it will be published and launched with an event during Volunteers’ Week in early June 2013.